It’s odd because often there’s only one glaring weak point in a team’s breakout – passing, board play, execution – but the Sabres have been able to hit on every facet. Further, the disjointed breakout that is acting as little more than a punt back to the other team’s defensemen has also led to breakdowns in Buffalo’s forecheck. Their lack of possession has served as a trickle down to unsuccessful dump-ins or mishandled zone entries that ultimately wind up back in the Buffalo end of the ice. All of these factors add up to show why the Sabres are seeing so many more pucks directed towards their net and why the ice feels tilted in the wrong direction. While Buffalo’s struggles led to the disintegration of a two-goal lead, the way they got to 3-1 was fairly impressive. Marcus Foligno was a force, scoring a pair of impressive goals while Torrey Mitchell blasted a one-timer past Cam Ward on the short side. Carolina tied the game on two separate occasions as Riley Nash brought the game even at one early in the second and then Chris Terry and Zach Boychuk combined to erase the two-goal deficit. The latter two goals came during Carolina’s third period onslaught and probably came with an ominous sense of foreshadowing given how ineffective the Sabres were for much of the third. Buffalo managed to find their legs again in overtime and ultimately in the shootout. Jhonas Enroth saw only 25 shots on goal as many of Carolina’s 70+ attempts were blocked or sailed wide and he made seven more in the shootout. Enroth was certainly deserving of a win after suffering through a barrage in his first two starts of the season. Buffalo will have another good shot at two points when Florida comes to town on Friday evening. Fans shouldn’t place too much value in the numbers posted by either Sabres goaltender this season. Both Enroth and Neuvirth have turned in strong performances the ultimately eclipsed the five-goal marker as the Sabres we overrun. Neuvirth was steady throughout Monday’s loss to Anaheim while Enroth had a good outing in Chicago. However, as the Sabres saw over 40 shots directed on net between each game, the team and it’s goaltenders eventually folded to the pressure while yielding an ugly number of goals in the process. Tuesday must have been a nice respite for Enroth even though he was tasked with turning away a number of high quality chances. The Hurricanes missed a number of point blank opportunities due to poor passing early on and you could argue that they could have easily ran away with the game. Count on seeing more of Enroth as he’s proving to have a little more consistency early in the year. I wrote about this yesterday but it’s definitely time to send Sam Reinhart back. As valuable as it may be to keep him in the NHL so he can learn to be a pro and witness the speed at the NHL level, he is no longer benefiting from the experience. If he’s only going to see 6:39 of ice he might as well be in Kootenay playing over 20 minutes each game. Ditto for Nikita Zadorov who is firmly entrenched at number eight on the depth chart right now. Let him go play big minutes in London and be the dominant force you drafted him to be. More and more talk surrounding Tyler Myers and the Detroit Red Wings probably has every segment of the fan base in some sort of frenzy. Determining what the best course of action is with a swift skating, 6’8” defenseman with strong offensive instincts is difficult. While there have been a handful of ups and downs from Myers since his Calder Trophy season, his value to any organization is obvious, which will make him very difficult to deal. If any trade is offered up for Myers you have to assume the bare minimum asking price is for a 2015 first round pick although I would hope the Tim Murray doesn’t bow for anything less than a top prospect and a 2015 first. Perhaps that means he’d need to send something along with Myers to help balance out the deal. 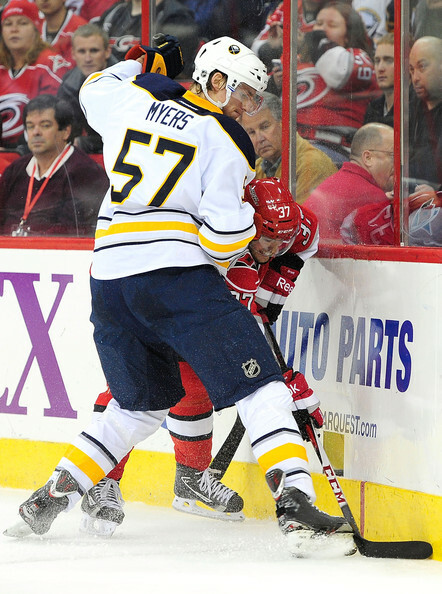 Tuesday was the third game that Zemgus Girgensons was front and center in the eyes of the fans. While shootout goals don’t count, you have to be a little excited at his increased skill in the attacking end. I’m still on the lookout for 20 goals from him this season.